Water is such an important element in a garden. The sound of water both cascading strongly or moving slowly over natural rock is so soothing. It provides a great ambience. 1. What space do you have? Water can be incorporated into any size or type of outdoor space. If you have a small courtyard space, think about using the vertical plane and create a waterwall which will save you space but still keep in the important water element. You could also think about rills, small still or reflective pools and stepping over water to incorprate water features in small gardens. If you have more space you can think about having a larger body of water in your garden. 2. Where is the space? 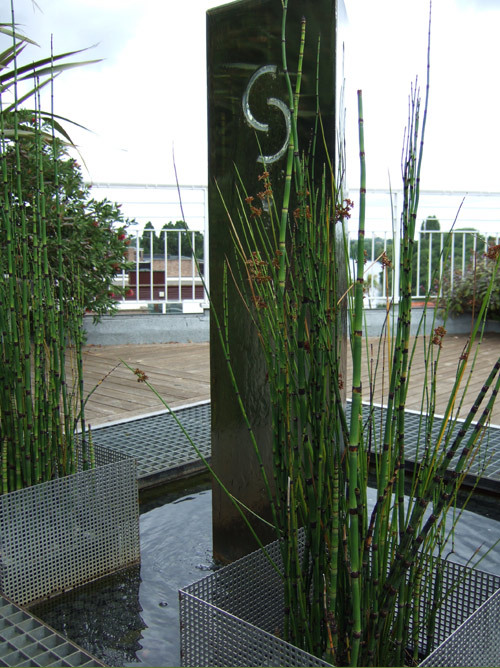 There are different challenges to create a successful water feature in different areas. For example, you will need to think about wind action on a balcony or roof terrace environment or.. Is the water feature in a public space where stricter safety precautions will need to be taken? Are there children that could be playing nearby? 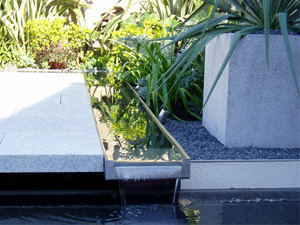 as this would also affect the type of water feature from a safety point of view. Water features in sunny positions always have that extra sparkle factor! Is it in a contemporary setting, or somewhere more traditional? 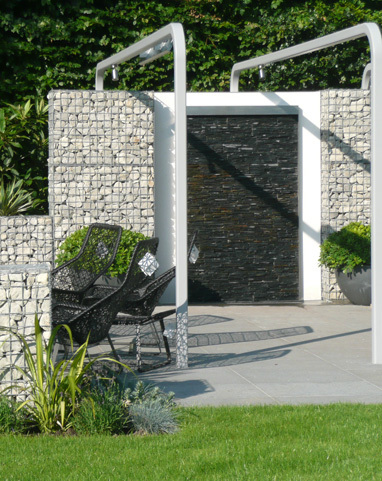 Water feature design should always complement the garden design and tie into the outdoor space as a whole. 3. Consider the element of sound. As we have already mentioned, the sound of water creates great ambience in the garden. The sound of water can vary greatly, so you should think about what you are looking for. Large volumes of water cascading over a broken surface will create a loud waterfall effect, which could be great if you are trying to block out the sound of traffic in an urban environment, but may not be that suitable, and possibly disturbing, if the water feature is right by your bedroom and you want the water feature lit up at night to be viewed from the house. In this case, less volume of water flowing gently over a glass feature might be more appropriate. Something inbetween could be just the perfect balance to provide you with tranquil background water ambience on your garden terrace. 4. But arent water features high maintenance? No water feature is entirely maintenance free. But they can be low maintenance if the right measures are put in place to ensure you a trouble free water feature. You will need a good pump and filtration system sufficient for the volume of water. We would suggest that fish not be included in low maintenance water features as their presence in your catchment pool will limit the chemicals you can use in the water to keep it clean. 5. Designing water features and getting them running well is not always straightforward. There are always unknown elements and adjustments will always need to be made to get it perfect. So always use someone with experience in successful water feature design coupled with a contractor with similar experience.